Spicy! This might be the first impression when talking about Korean kimchi. 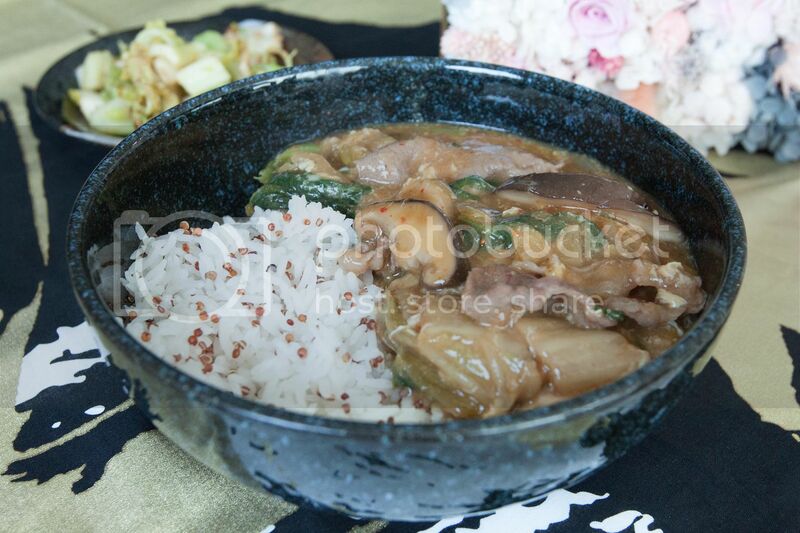 Indeed, this pickled veggie can be pungent and tongue numbing in a way, but when used as part of the seasonings and served over rice, the flavor softens. Instead of that instant kick on the palate, gentle spiciness and pickled aroma round up the entire braise and provide more depth to the dish. There is no need to use exactly the same ingredients I have listed up there. It doesn't have to be "Hiroshima" cabbage, any type of Chinese cabbage will do. The same goes to quantity, a little variation is fine as long as it suits your own preference. Cook the rice first. Destem the shiitake mushrooms and slice the caps. Trim off the stems from leafy greens and cut into about 2 inch long sections. Grate the ginger. Peel and slice the garlic cloves. Peel and slice half of the onion. Beat two eggs on the side. Drizzle some oil to a big pan and turn to medium high heat. Add in onion, salt, and pepper. Cook till onion turns translucent then add in garlic and grated ginger. Give it a quick stir till that garlicky aroma comes out but not over-browning the garlic pieces. Add in tougher veggies first, switch to high heat here if preferred. Also transfer shiitake over and cook for 30 seconds or more. 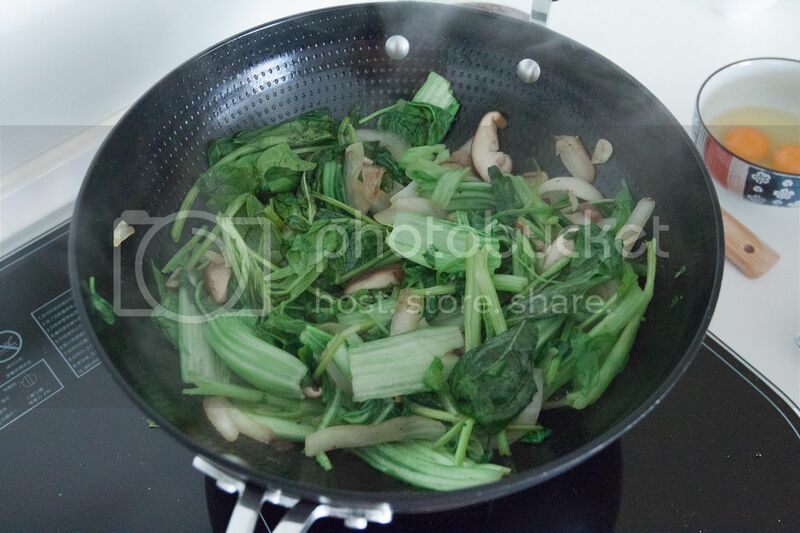 Transfer remaining tender leafy greens to the pan and give it a quick stir. Pour in the kimchi along with its juice. Also pour in chicken stock. Bring it to a boil then lower to a simmer. 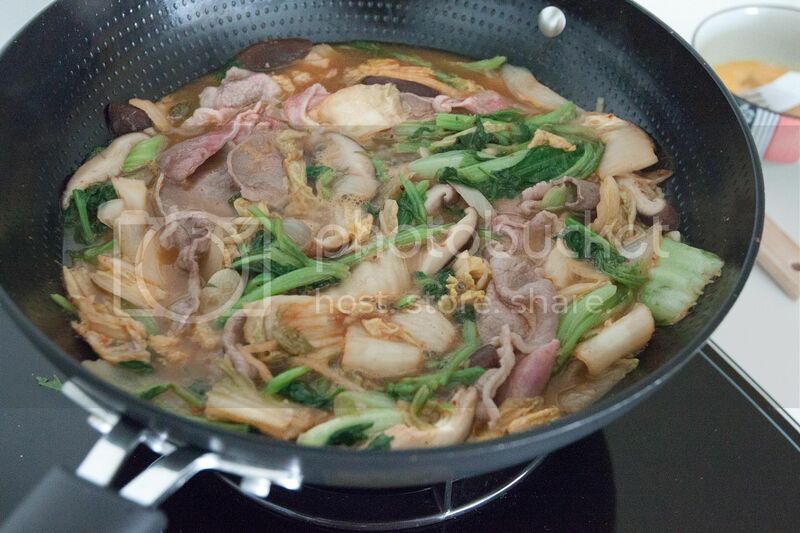 Add in beef slices one at a time, also soy sauce, soy sauce paste, and oyster sauce. Let all the ingredients "braise" for a short moment then turn to low heat. Wait till temperature drops then pour in corn starch water while gently stirring the mixture at the same time to prevent lumps. Adjust the thickness with more corn starch water if needed. It should be gooey but not soupy. Lastly, pour in beaten eggs and only stir it slightly for couple rounds. Scoop this kimchi beef mixture over rice. Not too spicy and not too sourish, Korean kimchi here provides just the right touch to the whole dish. 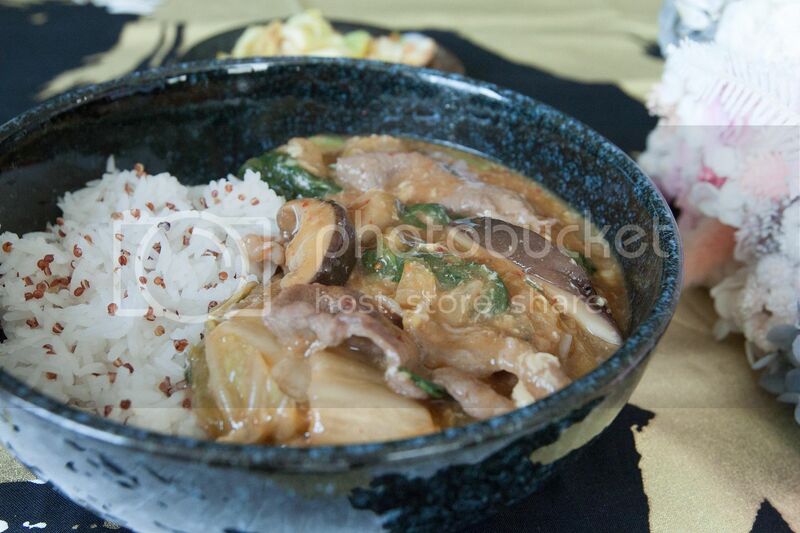 On top of flavors, the fresh cabbage was already cooked down and turned to softer texture. But the kimchi cabbage still has that crunchy bite, which provides even more depth to this comforting meal. JANICE WONG DESSERT BAR - What is Dessert?